GRETNA Cricket Club held its annual dinner and trophy presentation at the Gretna Parish Hall on April 2. The evening was well attended with about 60 members and guests in attendance, with many still going in the early hours of the morning. Ben Rainbird and Darren Lennox both took home a swag of trophies, while Brian Smith received three including the Gretna I and Gretna II catching awards. A highlight of the evening was the awarding of life membership to club stalwart Ben Rainbird. The presentation was made by Colin Cunningham who said Rainbird had given outstanding service since playing his first game back in 1986 at just nine years of age. The hard-working committee member has been secretary of the club, runs the canteen and has always been first on board with club projects. On field, Rainbird has been just as dedicated, playing 301 games (242 for Gretna I and 58 with Gretna II). He captained Gretna I for eight seasons and played in five premierships in a row. Rainbird made 5714 runs with a batting average of 23.04 and a top score of 170. He took 243 wickets with a bowling average of 21.06, as well as 118 catches. Ben is a popular member of the club who thoroughly deserves this award. He becomes the 19th life member of the club. Other life members in attendance at the dinner were Peter Rainbird, Joey Hack, Paul Jarvis, Glenn Blackwell, Tim Lowe and Mathew Burns. It was also nice to have the Member for Derwent, Craig Farrell MLC, and wife Lee in attendance. Congratulations to all trophy winners and thank you to all trophy donors and sponsors for their ongoing support and generosity. Well done also to the club members who catered for the night. The meal and desserts were delicious. Gretna I trophy winners - Batting average: Ben Rainbird 35.00; Aggregate: Ben Rainbird 420 runs. Bowling average: Corey Ransley 16.57; Aggregate: Aaron Maddox 31 wickets. Most catches: Brian Smith 16. Geoff Jarvis Memorial Trophy (best all-rounder): Aaron Maddox 318 points. Players award: Ben Rainbird and Corey Ransley 16 votes each, Runner up: Aaron Maddox 12 votes. Best in finals: Ben Rainbird 19.5 points. 100 Gretna I games: Aaron Maddox. 150 Gretna I games: Craig Cunningham and Peter Jelkic. Gretna II trophy winners - Batting average: Brian Smith 29.67; Aggregate: Luke Wheeler 262 runs. Bowling average: Darren Lennox 27.81; Aggregate: Darren Lennox 16 wickets. Most catches: Brian Smith 9. Best all-rounder: Darren Lennox 153.5 points. Players award: Darren Lennox 13.5 votes, Runner up: Cameron Emery 10 votes. Cecil Gray Memorial Trophy (Best under 21): Zac Crosswell 185.5 points. Captain's Trophy: Craig Cunningham. Best Clubman: Colin Cunningham. 50 Gretna II games: Cameron Emery. 150 Getna II games: Damien Hack. Other awards - 300 Club Games: Ben Rainbird. 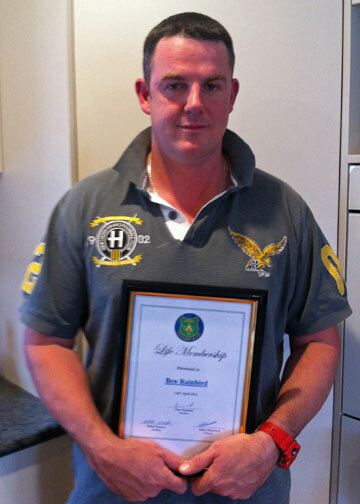 Life Membership: Ben Rainbird. Duck Trophy: Adam Browning 5. 100 club games: Adam Browning, Rhys Browning, Aaron Maddox and Cameron Emery. 150 club games: Darren Lennox and Jackson Ackerly.